NASA's Spiritrover currently exploring Mars completed one full swing around the Sun Monday,giving researchers a year-long look at the Martian seasons. "We feellike, weather-wise, we've just about seen it all," said Sharon Laubach, therover's integrating sequence team chief, in a telephone interview. "We've gonethrough all the seasons, we've survived Martian winterand gone through conjunction...yes, we're having a party." While bothSpirit and its robotic twin Opportunity hit the one Earthyear mark of their mission in January, researchers said the Nov. 21 Martiananniversary holds far more significance for the long-lived rovers. "It's abig, important milestone," said Steve Squyres, principal investigator of therover's science mission at Cornell University in Ithaca, New York in an earlierinterview. "We'll have acquired an entire year's worth of observations." One Mars yearis longer than Earth's (about 687 Earth days), with Spirit hitting itsanniversary on the 670th sol - or Martian day - of its mission. Spirithas rolled across 3.3 miles (5.4 kilometers) of Martian terrain at its landingsite inside the planet's Gusev crater. Opportunitywill complete its first Martian year exploring the plains of Meridiani Planumon Dec. 11, mission scientists said. Both rovers toucheddown on Mars in January 2004 on a primary mission that spanned 90 days. Spirit andOpportunity are currently experiencing the final days of Martian summer and preparingfor the onset of autumn, mission managers said. During itsfirst Martian year, Spirit found dustdevils swirling across the planet's landscape and frost settling on the itssurface, researchers said, adding that the fringes of a major dust storm mayhave brushedOpportunity last month. "So theplanet, though it seems dead, does have a vibrant atmosphere," explained AmitabhaGhosh, an atmospheric scientist and rover science team member withGaithersburg, Maryland's Tharsis, Inc.
Ghosh isusing the mast-mounted Miniature Thermal Emissions Spectrometer (Mini-TES)aboard both rovers to study atmospheric changes depending on the Martianseason. "There aresome really seasonal phenomena, like the dust devils," Squyres said. Mars researchersinitially hoped to find many dust devils roaming across the Martian surface,but had to wait until earlyspring on the planet before the first whirlwinds were caught by Spirit'scameras. Theinfrared Mini-TES instrument, which is also used by geologists to determineMartian rock and soil minerals, records the temperature changes, dust levelsand water vapor in Mars' atmosphere. Mars researchers can also use each rover'spanoramic camera, which sits next to Mini-TES on the mast, to record dust devils,clouds and wind - which has apparently brushedthe robot's solar arrays clean from time to time. "[We're]trying to continue these routine measurements and, more importantly, look forpatterns," Ghosh told SPACE.com. In general,Opportunity's landing site seems to run a bit warmer than Spirit's - about 4 to6 degrees Celsius - while the surface temperatures at both sites hit their peakat noon local time, he said, citing rover observations. 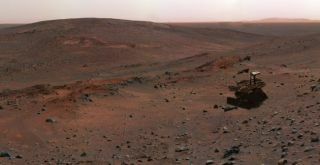 Building acomprehensive understanding of Martian weather will be critical for future redplanet expeditions, since wind, dust storms and other atmospheric phenomena canfactor into a mission's landing, Ghosh added. A large duststorm that cropped up at Meridiani Planum in 2003 flung dust all the overto Spirit's Gusev Crater landing site and reduced the density of the air there,forcing mission planners to alter the rover's timeline for opening its parachuteduring descent. Meanwhile,the weatheron Mars should begin to turn as the landing sites for Spirit and Opportunityhead further into fall. In about104 Martian days, or sol 775, rover handlers hope to have both rovers onSun-facing inclines to maximize the amount of sunlight striking their solararrays, Laubach said. The technique helped the rover mission weather the lastMartian winter. Spirit iscurrently rolling down Haskin Ridge as it descendsfrom the summit of Husband Hill and makes its way toward a feature dubbed 'HomePlate.' Opportunity, meanwhile, continues to creep around ErebusCrater. Despitetheir accomplishments, Spirit and Opportunity have a long way to go to set anendurance record on Mars. Both mission times pale in comparison withNASA's twin Vikingmissions. Viking 1and Viking 2, both of which set down on Mars in the summer of 1976, spent severalyears recording Mars from their stationary landing spots. Viking 2's missionended in April of 1980 about 1,281 Martian days after landing when itsbatteries failed. Viking 1, however, continued to function until Nov. 13, 1982,more than four Earth years after arriving on Mars. While theirlongevity is impressive, the Viking missions had a powerful - literally -advantage over Spirit and Opportunity. Both landers relied on radioisotope thermalgenerators (RTGs) that converted heat from decaying plutonium into electricityinstead of solar arrays. Dustbuildup has gradually degraded the amount of power available from the solararrays aboard Spirit and Opportunity. Both rovers were initially able togenerate about 900 watt hours of power from the available sunlight, though dusthas clouded their solar panels. Spirit'ssolar arrays currently produce about 650 watt hours while Opportunity'sgenerate up to 700 watt hours, Laubach said. A minimum of 300 watt hours isrequired for Spirit to function, though Opportunity can operate on slightlyless, she added. If Spiritand Opportunity continue to perform as they have for the last few weeks, it'sentirely possible that they could make it through January 2006 and their secondEarth anniversary exploring the red planet, mission managers said. "Thoughcertainly they could die tomorrow, that's just a fact," Laubach said, addingthat she and other rover team members have been amazed at the mission's scienceoutput so far and hope for continued success. "We certainly haven't seeneverything there is on Mars."